Inside, we explore the band’s reinvention as they entered the studio to record Rubber Soul and continue into their stellar new phase offering up detailed profiles on their monumental later albums Revolver, Sgt. Peppers Lonely Hearts Club Band, Abbey Road and The White Album. 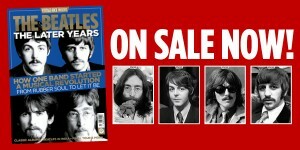 Plus we explore the recording of Let It Be and on to the final days of the world’s greatest group. Elsewhere, we look at the Liverpudlians’ final touring days, we head East for a look at the band’s tenure in India, and examine Yoko Ono’s infamous entry into the band’s inner circle. Plus, we revisit the group’s duo of psychedelic films –Yellow Submarineand the Magical Mystery Tour – and interview ex Apple Records CEO Tony Bramwell about his time working under the Apple Corps umbrella. Order your copy of this issue today for just £8.99 (inc.P&P) HERE. Download your digital edition HERE. Find this issue in store at Tesco, Sainsbury’s, WHSmiths, Eason’s and independent retailers. Find your local stockist HERE. This issue also available in an exclusive fan pack, including 4 art cards for only £15! Just click HERE. The fan pack offer is exclusive to the Anthem Publishing shop only, and served on a first come first served basis. Order quick before stock runs out! « The Elvis Years – Vol. 1 On sale now!